Kenny Gibbs was a pleasure to work with! He was very professional and flexible in helping us finalize our music selection. He is very sweet and accommodating to all your needs. The music timeline is easy to fill out, and you can make it as detailed as you want. He kept the dance floor packed the whole night, and everyone had a blast dancing! Thanks Kenny! 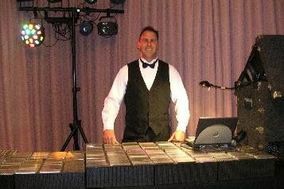 We are so pleased that we chose Kenny Gibbs (Total Quality Music) to DJ our wedding. Kenny was completely professional in every area. He met with us twice before the ceremony to create a timeline and sample music that we wanted. His website was very user friendly for us to select our music. He provided a portable system for our outdoor ceremony, as well as a state of the art system for our indoor reception. Kenny had the dance floor packed from right after the first dance until the end of the evening. Kenny was so entertaining and catered to all to our and our guests requests. We couldn't have hoped for a better experience and have since become personal friends with Kenny and his wife. Kenny made our evening so very special, we can't thank him enough! Awesome!!! Kenny I'll make your wedding perfect! He makes everything run smoothly and makes sure everyone has a great time!! You'll regret not choosing him! Anthony was the best DJ ever. He had all my guest dancing all night long. This was the best night ever!!! Kenny was awesome! He was so flexible and helped me keep a surprise from my groom, I wanted to walk down the Aisle and half way through cut to a different song for a surprise for everyone, and he helped me with it flawlessly. He played awesome music, took requests, and saw that we had a few Disney decorations and played sweet instrumentals from disney classics, without me even asking! He was funny and easy to work with, he played every song we asked for. Our DJ was set up through our venue and they were great, I was in touch with Kenny before hand and I had Jordan as our DJ. He was GREAT! followed our music to a tee and played great music. He took requests and was on top of the flow of the wedding and the events that took place. He was professional and had a great attitude I was very pleased with the service. Kenny is awesome!!! We loved his energy, and professionalism. He made our wedding day phenomenal. I wanted nothing more than to dance on my wedding day, and he made sure that happened playing all of our requested songs. He made sure that our wedding went smoothly, and many people commented on our DJ and how wonderful he was. I highly recommend Kenny Gibbs for any event. Kenny was an amazing DJ! He was so organized and so fun to work with! Lots of energy, even got on the dance floor at our wedding! Everything you would want in a DJ for your wedding day or any event! Our DJ was very organized and professional. He coordinated all of our events for our reception and made our wedding day perfect. The music sounded amazing but most of all he was personable and made everyone have a great time. Our DJ really knew how to keep the dance floor exciting and fun. I would highly recommend Total Quality Music for any event. I am planning on using them in the future for sure. Total Quality Music did a fantastic job for our entire wedding. We had some specific instructions (guest that wanted to give toast but we did not) and he handled it with no problem. We had a couple not so main stream songs (hard rock type) that they were able to provide with no problem. He kept the party moving and everyone dancing all night long. Terrible experience. Came with Wedgewood Fallbrook. DJ was late, which was nervewracking! Here's how detached they were from our service -- 2 minutes before the ceremony started, (late, since the DJ was late), I had the DJ asking how to pronounce my name, which he proceeded to mangle. Then, for the rest of the night, he kept bothering me (the bride) to tell me we were behind schedule. It made the whole night so stressful for me. Do NOT use these people. They are checked out. Even if they come with the Wedgewood package, opt out and use someone else.